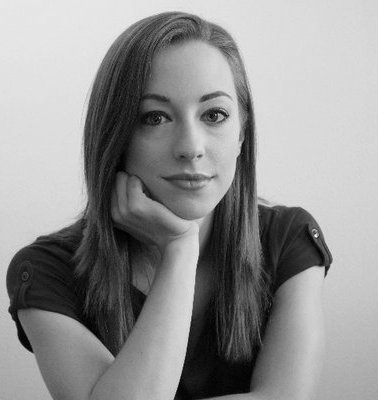 February 28, 2019, 11:00 a.m.
Only about half of women surveyed in many of the nation’s largest 20 urban areas — including Los Angeles, Chicago, and New York City — are aware of access to female-focused health clinics in their city. The American College of Obstetricians and Gynecologists says that people in large urban areas are more likely to have access to women’s health care providers, including OBGYNs and reproductive care that can decrease the chance of undiagnosed cervical cancer and breast cancer. But, data collected from a YouGov Omnibus/CityBus survey indicates that even in many of America’s largest cities, awareness around access to women’s health care is not guaranteed. 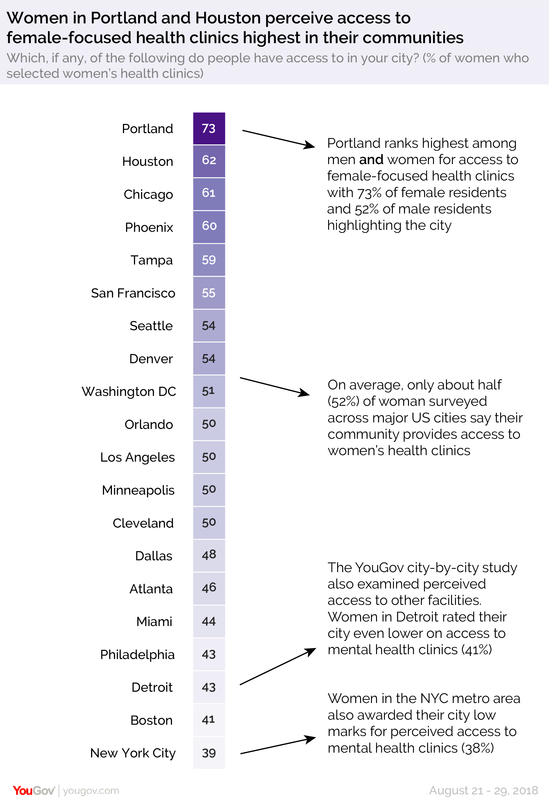 Overall, Portland (73%) and Houston (62%) take the top two spots on the list of cities where female residents attest to having access to women’s health clinics. 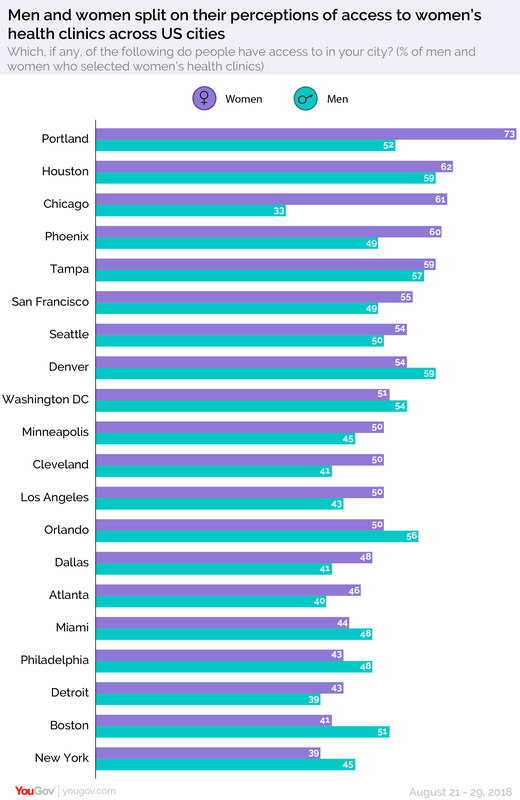 Following those two cities, Chicago (61%), Phoenix (60%), and Tampa (59%) round out the top 5 when only female opinions on access to women’s health clinics are considered. At the bottom of the list, only around one-in-four female residents in the New York City area (39%) say people in their city have access to women’s health clinics. In addition, Boston (41%), Detroit (43%), and Philadelphia (43%) were given low marks by female residents. On average, men and women remain within 8 percentage points of each other on whether or not they believed their city provides access to women’s health clinics, though there are exceptions. Chicago carries a 28-point gender gap with 61% of women to only 33% of men agreeing that the city provides access to women’s health clinics, and Portland carries a 21-point gender gap — even though it held the top spot for access to women’s health clinics among both men and women. In other major US cities, male residents are more likely than female residents to say people have access to women&apos;s health clinics in their cities. This appears to be the case in cities such as Denver, Washington DC, Orlando, Miami, Philadelphia, Boston, and New York City. YouGov Methodology: Total sample size was 4,065 US adults aged 18+ (i.e. approximately 200 people per metro area). Interviews were conducted online between August 21-29, 2018. The respondents surveyed in this study reside in the following Designated Market Areas: Atlanta, Boston, Chicago, Cleveland, Dallas - Fort Worth, Denver, Detroit, Houston, Los Angeles, Miami - Fort Lauderdale, Minneapolis - Saint Paul, New York, Orlando - Daytona Beach Melbourne, Philadelphia, Phoenix, Portland - Oregon, San Francisco - Oakland - San Jose, Seattle - Tacoma, Tampa - Saint Petersburg, Washington DC. Read the city-by-city data on domestic violence, and learn more about YouGov Omnibus polling.